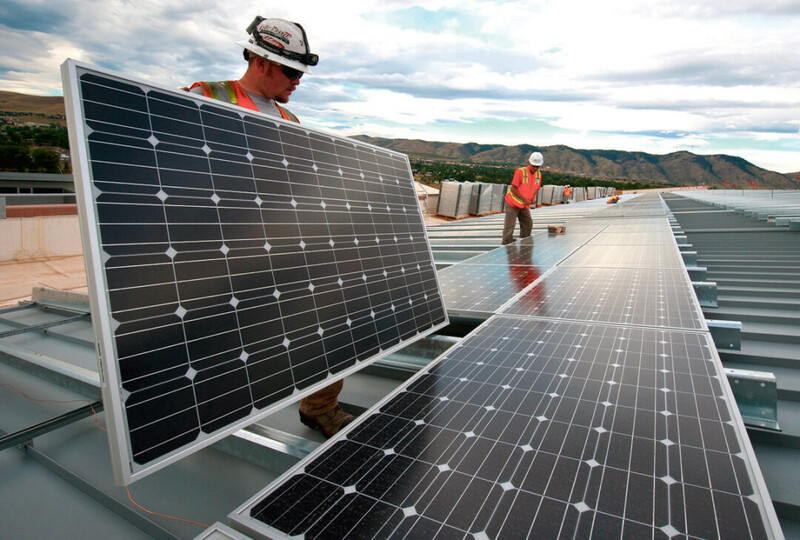 Workers install solar panels as part of a U.S. Department of Energy/Xcel project in Colorado. Most people love summer for the same reason: the sun. It warms us up after the harsh winters our state is notorious for – at least for a few months. But that great big burning ball of gas in the sky gives us more than a free tan: Many people are recognizing its ability to provide us with a renewable energy source. According to a 2014 Member Satisfaction Survey by Eau Claire Energy Cooperative, 55 percent of co-op members felt it was important that green power be provided to customers. With this recent surge of interest, Eau Claire Energy Cooperative and Xcel Energy are both launching major solar energy projects that will impact the future of Eau Claire’s energy situation. “The community solar garden program is going to be a great option for customers who want to use solar energy but don’t want to or can’t install it on their own property,” said Deb Erwin, the manager of regulatory policy for Xcel. Through the new Solar*Connect Community program, which was recently approved by the state Public Service Commission, Xcel plans to provide a source of renewable energy to customers in western Wisconsin. Three megawatts have been approved for the program, which means that Xcel has the potential of installing three “solar gardens” producing one megawatt of power each. With the help of participating customers, Xcel plans to have the solar gardens installed by 2016. With that in mind, the program requires help from some of Xcel’s customers. Those who agree to take part will pay an upfront cost for their subscriptions; the number of gardens built will depend on the number of people who sign up. (Customers who don’t take part in the program won’t be charged.) If member participation is only high enough to build one solar garden, then that’s what will be built. If there is enough support to exceed three megawatts, Xcel will begin exploring the option to expand the program. When I met with Lynn Thompson and Mary Kay Brevig about the co-op’s solar energy program, MemberSolar, I got a chance to see the piece of land between Eau Claire and Fall Creek where 2,816 stationary panels will be installed. Nine stakes were stuck in the ground where nine rows of panels are slated to be built and operational by Oct. 1. The co-op has hired Able Energy Co. to install the panels; the company specializes in solar energy and has installed fields like this throughout the United States. Similar to Xcel’s program, this is a community solar project that requires help from members, but only those who want to take part. If people don’t want renewable energy, then they won’t have to pay for it. Members can make a one-time payment for one unit of power, all the way up to 30 units depending on how much energy they need. Those who purchase units will receive credit toward their monthly energy bills, which Thompson, the co-op’s president and CEO, believes makes a lot of sense economically. “You’re essentially pre-paying for your electricity upfront,” he said. What are some advantages to all this? One benefit of both programs is having access to renewable energy without the burden of maintaining solar panels. For example, as Brevig – the co-op’s communications manager – pointed out, if the panels are damaged then it’s the utility companies’ responsibility to fix them. Furthermore, many customers simply don’t have room on their property for solar panels. By using their own land for the solar arrays, Xcel and Eau Claire Energy Co-op have solved this problem as well. No matter how beneficial these programs are, their success relies on customers’ willingness to participate. Studies have shown an interest in solar energy within the Chippewa Valley, and now we can tap into it. If you are interested in either program, learn more at www.xcelenergy.com or www.ecec.com.